On the Podium: Guest lecturers..
“Global Perspectives on the Holocaust” is the theme of the 10th International Holocaust Studies Conference in the James Union Building at MTSU Oct. 19-22. Alexandra Zapruder, writer and educator, who will present “Salvaged Pages: Diaries of Teenage Girls in the Holocaust” at 11 a.m. Saturday, Oct. 22. Another highlight of the four-day conference will be the free public screening of “I’m Still Here: Real Diaries of Young People Who Lived During the Holocaust,” featuring actors Kate Hudson, Zach Braff, Ryan Gosling, Amber Tamblyn and Elijah Wood and a musical score by Moby. It will be shown at 3 p.m. Friday, Oct. 21, in the JUB. The entire conference is free for MTSU faculty, staff and students. 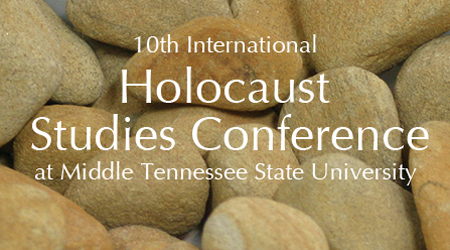 For more information, contact Dr. Nancy Rupprecht, chair of the MTSU Holocaust Studies Committee, at 615-898-2645 or holostu@mtsu.edu, or visit http://www.mtsu.edu/holocaust_studies/ for the complete conference schedule.